4D Technology Corporation, manufacturer of optical metrology systems, has introduced a Vertical Digital Radius Slide for precise Radius of Curvature (ROC) measurement of concave or convex optics. 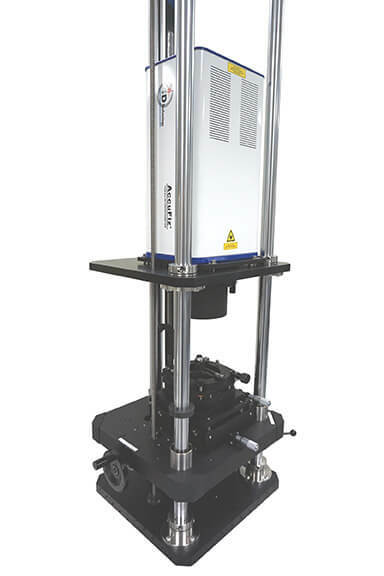 The Vertical Digital Radius Slide (VDRS) provides axial positioning resolution to 1 µm for extremely accurate Radius of Curvature measurement using 4D Technology’s AccuFiz® compact laser interferometers. The VDRS integrates with 4D Technology’s 4Sight data analysis software for fast, wizard-based ROC measurement. The system can accurately measure ROC without precise null at the cat’s-eye or confocal positions, resulting in increased accuracy and throughput. Easy to use controls and a long travel range make the VDRS simple to install and to use daily. 4D Technology’s family of digital radius slides also includes an encoder-based horizontal slide, and a horizontal slide with Laser Doppler Distance Measurement (LDDM) for 10nm axial position resolution. AccuFiz Fizeau laser interferometers offer unmatched lateral resolution and the ability to measure optical components and systems without vibration isolation. With a wide range of apertures and wavelengths, and a comprehensive line of accessories, AccuFiz interferometers provide best-in-class value and performance.